Fran’s Frame Shop and Galleria offers professional custom framing, home decor, local artists work and so much more. Fran’s has been located in the heart of Searcy, Arkansas as a family owned and operated boutique and gallery for more than 23 years. Small business’ and unique services are the lifeblood of Searcy’s family oriented small town atmosphere. Fran’s is a quaint little art shop filled with treasures that have been lovingly handcrafted by local artists and artisans. There is always a large selection available for all tastes and budgets. The art and decor change daily but the inherent value of art to be life enhancing and entertaining never does. 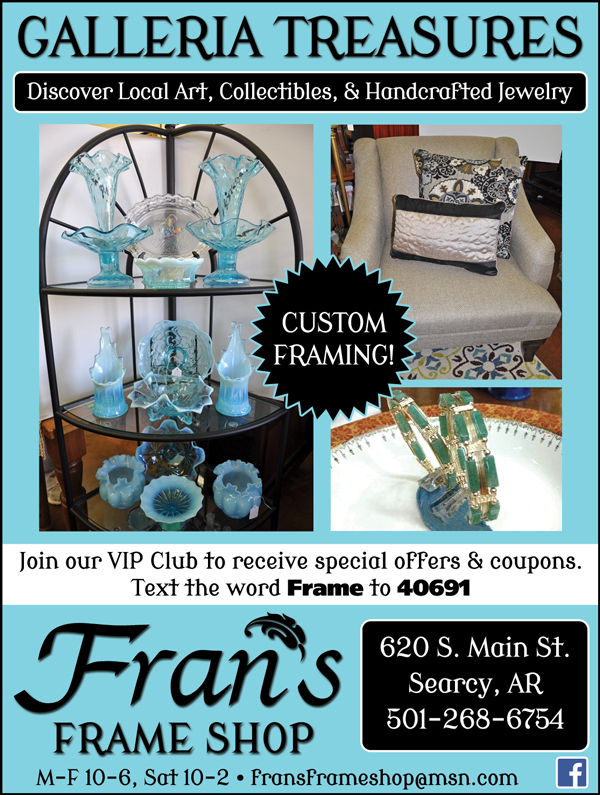 Come by Fran’s Frame Shop and Galleria at 620 S Main in Searcy today to see what’s available! Visit Fran's Frame Shop And Galleria's Facebook page.